Sleep apnea is arguably one of the most frustrating sleep disorders out there. This issue will create either shallow breathing or pauses in your breath multiple times an hour whilst you are trying to sleep. As a result, those who suffer from this problem oftentimes find themselves exhausted throughout the day due to having a disrupted sleep schedule. In spite of this, most people who are plagued with sleep apnea are oftentimes unaware their sleep is constantly being interrupted and as a result, sleep apnea very often goes undiagnosed, even during routine visits to the doctor’s office. Because of this, we can only emphasize how important it is to raise awareness and treat those suffering with sleep apnea in Toronto and the GTA. With several CPAP machine stores located around Southern Ontario, PROFMed Healthcare Solutions is prepared to assist you in dealing with this frustrating sleep disorder. In order to handle sleep apnea, it is important to understand its seriousness and commonality. Although it can affect people of all ages, older and heavily overweight individuals are most likely to be troubled with this condition. In Canada, over 850,000 adults are reported to have been told by a medical expert that they have sleep apnea whilst in the United-States, the numbers are as high as 12 million, according to the National Institutes for Health. These are not insignificant numbers by any means. What Are The Risks in Sleep Apnea? Although untreated sleep apnea is a leading cause of daytime exhaustion, there are many other issues that can accompany it. This includes a heightened risk of driving and work-related accidents as well as certain health complications like diabetes and in extreme cases, death. Fortunately, there are many ways to figure out whether or not you have sleep apnea (or OSA). Your doctor or health care provider can ask you relevant questions to see whether you have the symptoms and oftentimes they may request that you undergo a sleep study involving an overnight stay at a sleep clinic in order for trained professionals to observe your sleeping on a more technical level. Following this, they may recommend you receive continuous positive airway pressure (CPAP) treatment. This is where we come in. What Is The Best Treatment Available For Sleep Apnea? 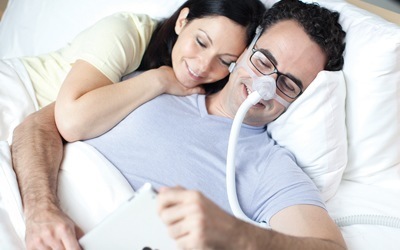 In order to treat sleep apnea, a CPAP machine is not only one of the most researched and common forms of treatments out there, it is especially one of the best selections available. These machines push air into a mask you wear while sleeping. The flow of air travels into your nose and/or mouth, ensuring your throat remains open and prevents you from being awoken by pauses in breathing. There are many different kinds of CPAP machines and masks suitable for the specific issues of each individual and we can guarantee that you will not only have more fulfilling nights sleeping, but other issues like snoring will oftentimes clear up as well. As a leading supplier of CPAP equipment, PROFMed Healthcare Solutions can assist you in treating your sleep apnea in Toronto as well as in many cities throughout Ontario. To find out if our CPAP machines are right for you, call us today at (416) 876-2544. People with sleep apnea have pauses in their breathing as they sleep. These pauses can differ from person to person. The pauses can be periods of shallow breathing or a person may stop breathing completely. Each pause might last a few seconds or as long as a few minutes. These pauses may be very infrequent, but can occur as many 30 times or more during the course of an hour. Sleep apnea greatly affects quality of sleep. When the body is not getting enough oxygen, it may move from deep sleep to light sleep. This is why many people are never even aware that they have this condition. Sometimes, when normal breathing returns, the person will make a choking or snorting sound that might wake them or a partner. Sleep apnea can affect children and adults. While children can experience any of the above symptoms, but other signs in children can include poor school performance and favoring breathing from the mouth rather than the nose. Most people who have sleep apnea have the obstructive version. This means that the difficulty breathing occurs because airways are blocked during sleep. While this is more common among overweight adults, there are other reasons why airways might be obstructed. For example, if any tissues in the nose or throat are enlarged or inflamed, such as the tonsils, this creates an obstruction. The other, much less common, form of this disorder is central sleep apnea. This occurs when the brain does not properly control your breathing during sleep. Because there is no obstruction, this type of apnea generally does not cause loud snoring. It is generally caused because of other medical conditions or as a side effect of medications. There are many different methods that are used to restore normal breathing. This includes mouthpieces that are worn to open airways or mechanical breathing devices. If no other options are suitable, doctors might suggest surgery to remove obstructions. In some cases, lifestyle changes and changes in diet can alleviate the problem, as losing weight and avoiding alcohol and cigarettes can help. If you feel that you might have sleep apnea, speak with a doctor to determine the best treatment plan for you.